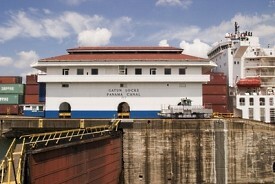 Colon is located at the northern entrance to the Panama Canal. It is an international trade city, most notable for the Colon Free Zone, an import/export hub and a good place to shop. Also in Colon are magnificent colonial Spanish forts such as Fort St. Lorenzo. Water-sports enthusiasts can head to Mamey and Isla Grande islands for scuba diving, swimming and sailing. The Port of Colon is located approximately an hour and a half from the Tocumen International Airport. Secured parking is available at the pier at a rate of $30.00 per week (subject to change). Driving from Tocumen International Airport to Port of Colon - Take the Domingo Diaz Avenue and go straight to the Ricardo J Alfaro Avenue (no turn to get to this Avenue), continue to take La Paz Avenue, which is in the right lane. Keep straight and follow signs for Corredor Norte (which is the highway to Colon). The road will divide in two, stay in the right lane and you will enter the highway, Alberto Motta. Drive about half an hour until you reach the City of Colon. Continue straight thru town. Turn right onto 13th Street. Follow street until you are only able to turn left onto Paseo Gorgas, where Colon 2000 Pier is located. Driving from the city to the Port of Colon - Take the north corridor to Chilibre, here you will connect to the transismic highway to Colon. At entrance of Colon stay in Central Avenue. Take 9th Street to the right straight to the Port.